Hi. My name is Kevin, but you can call me Hungry Cat, my trail name from my Appalachian Trail thru-hike last year. 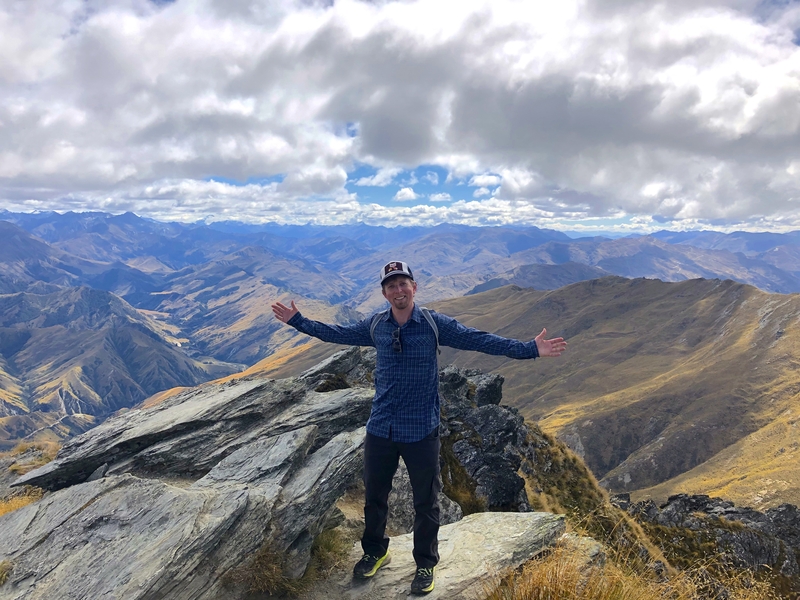 It was one of the grandest adventures of my life so far, and that’s saying a lot for a guy who is 41 and has lived abroad and traveled to many different countries. How did I end up hiking the AT at 40? In February of last year I decided I needed to make a change in my life. I had a a reasonably good career that I had built up over 15 years, but I worked way too much, was basically on call 24/7, and wasn’t getting a lot of satisfaction out of my day-to-day professional existence. I spent a lot of time frustrated and bored, solving the same problems over and over. For years, though, I just kept my head down and saved money, riding the gerbil wheel daily. I finally decided that I would leave in search of something more fulfilling, and in doing so it seemed like a great time to try a thru-hike. That’s how I ended up on the AT. What happened after my thru-hike and how did I not go back to work? My hike changed me in many positive ways. I was less afraid about not doing what I’d always done—focusing on career and earning money. Doing more with less on trail helped to diminish my long-standing fear of financial insecurity. I had a decent cushion of savings and decided that I would stay “funemployed” a bit longer. While the trail doesn’t really answer any of the big questions in life, it can give one a fresh lens through which to view things. I still had no idea what else I might do, other than what I had done before. I took some time to do normal stuff at home with my wife, Gillian, and our cat, Lucy. It was good to be with them after having been gone so long. We went to visit her family in upstate New York, checked out Montreal, and cashed in some frequent flyer points for a trip to New Zealand. I also took a solo backpacking trip to Vietnam and Cambodia. Finding work wasn’t on my radar; I was just enjoying my time off and time with my wife. Hungry Cat doing some “official thru-hike training” (goofing off) in New Zealand. OK, great, but how did I decide to thru-hike the CDT? Before I went to Vietnam in January, I talked with my wife about maybe doing another thru-hike. She gave me her blessing and we both arrived at the same conclusion: if not now, when? I first thought I would hike the Pacific Crest Trail, but the more I thought about the CDT, the more I wanted to have a bit “wilder” and more remote experience. It just called to me. As the more logistically difficult of the two trails, it also seemed like a good idea to hike it while I had the time to plan. Thru-hiking the PCT might be easier to squeeze in later. It was settled. The CDT it was! At the same time, I was really struggling to give myself permission to do another thru-hike. That old Irish Catholic guilt was rearing its ugly head, as it tends to do. I felt guilty for again leaving my wife and cat, and I started falling victim to my old ways of thinking. I would think things like, “I’ve gotta get a job and start earning money,” “I need to stay relevant in my industry,” or “I’m a bad husband for hiking again.” Yada, yada, yada. The truth was, I didn’t think these things; I just felt like other people would think these things about me. It took me some time to work through these feelings and realize that nothing mattered other than how I felt, and how my wife felt. She had given me her blessing; I just wasn’t giving it to myself. 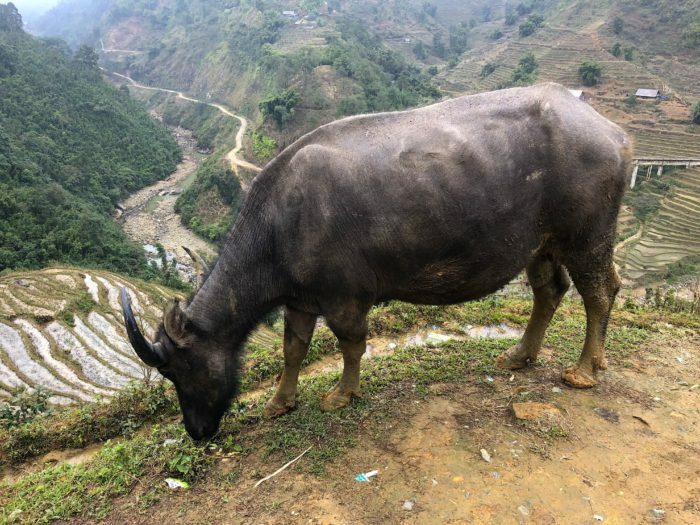 I hiked past many water buffalo in Vietnam. Good training for the cows on the CDT. In the end, Britney Spears told me it was OK.
One day, an old Britney Spears song popped into my head: “Oops, I did it again.” I don’t know why I thought of it. Don’t judge! I laughed, picturing myself waking up at the Crazy Cook Monument at the CDT Southern Terminus and saying, “Oops! I’m thru-hiking again!” And then it dawned on me—it really was that simple. I could do another thru-hike, and I didn’t really need to justify it in any way. It didn’t need to be the defining moment of my lifetime, nor did I need to feel bad or guilty about extending my “funemployment” time. Being away from my wife would be tough, but I should just be happy that I could do this and have her support and not have to feel like a bad husband. I needed to stop worrying about other peoples’ judgment and just do it. In that moment, I finally gave myself permission to do the thing I wanted to do—to thru-hike the CDT—guilt-free and grateful to somehow have this wonderful opportunity. So, that’s where I’m at. Preparation is in full effect. I will write more about that soon. I’m thrilled to get on a new trail and start this new journey. I’ve never hiked out West, so this will be a new experience I can bumble my way through. I’m also really excited to get the chance to blog for The Trek. I will be posting updates as I try not to die out there. Read my blog posts here on The Trek. You can subscribe to them here. I will post periodic updates, and probably some ridiculous stories, along the way. Subscribe to my trail journal on my blog, Unfettered Footsteps. These are detailed, daily journal-style posts and different content than what I will post on The Trek. The blog also houses a trail journal from when I hiked the AT, and some other adventure and lifestyle content. Subscribe to my YouTube channel. I will do a few video updates along the way and probably a gear overview before I leave. These will be short and either a general update or maybe some footage of cool trail stuff, like coyotes eating my food and me drinking out of cow troughs and whatnot. I do plan to create and release a video series of my hike once I am off trail. Follow me on Instagram and Facebook. I will post some pictures and whatnot along the way. See ya next post, and happy trails! Love it! I totally get it! Happy Trails Hungry Cat! That is great that you are heading back out on the trail. Makes me happy. Wallace is out there now, he started the CDT yesterday actually. Hopefully you will get a chance to catch up with him at some point. Hungry Cat! Best of luck on your trip. I ran into you in the Bigelows last July 4th, glad to hear you’ve had some great adventures since then. I’ll be following your hike from the PCT this year! I remember you Erin! Thank you again for feeding me some actual vegetables! It was fun watching fireworks and getting the foraging lesson from Master Splinter. Sounds like you are having an adventure of your own – good luck on the PCT! !